I've been working on making up all the printie projects I've spent the last few weeks collecting. It's slow going... You can find my own printable set of miniature Sindy furniture boxes HERE. This is a super interesting personal blog charting her progress on a course in advertising design. THIS post in particular offers Olbas, Strepsils, and a neat take on Mac packaging. Just use the snip tool and resize in MS Word (or, let's be real, free equivalent). Weebly site with lots of sixth scale printables - check it out HERE. I made up comics, candy and field rations. Flickr stream of an avid packaging collector. Images are right click protected, but you can just use the snip tool and resize. I made cereal boxes, and chocolate bars / sweets. Because the latter are going to end up so small, you need packaging where the brand name is really clear. I went for things like Wonka bars, Fizz Whizz, and Cadburys Caramilk. I also made some Pokemon cards (resize pics to 1.2cm in height), Space Raiders, and I printed out new labels for my Re-ment and Barbie CDs - I've been meaning to do this for months after seeing Amber of Sin in the City try it out. Action figure forum with plenty of printies on offer. THIS thread has medical supplies, while THIS one has lots of electronics. Each thread also has links out to other printable resources, like CyberDrone's collection of mini Star Wars and GI Joe toy boxes. Loads of printables in all the most common doll house scales. From the 1/6 range I used the floppy disks, cigarette boxes, and some retro style computer paper. Printables for 1/6 scale action figures - I made the Mr. Sparkle boxes. 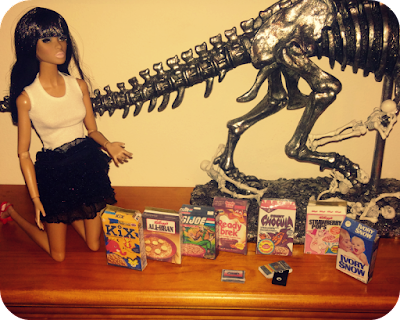 Darla Daley is very proud of her cereal collection. I printed on ordinary computer paper, glued it to a brown envelope (so it looks like cardboard), covered the picture side in sellotape (for gloss), then cut the box out and stuck it together. hello,i'm trying to find a cheap fully articulated doll like this one. where did you get it? This one is a Darla Daley doll from Integrity Toys - they're fairly expensive though. 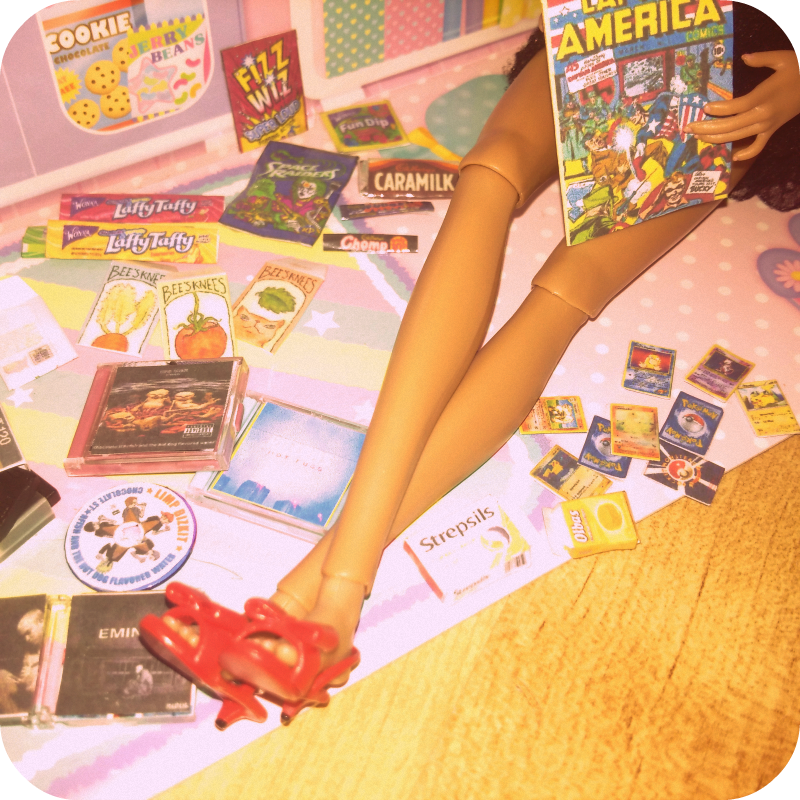 The cheapest fully articulated dolls at the moment are probably the Barbie Style range. They cost about £15 new. Hope that helps!